Downtown Dispensary, 221 E. Sixth St., serves about 2,000 patients. Operators of Tucson dispensaries say Tucson’s square-footage restrictions on cultivation sites mean there’s not enough locally grown cannabis to go around. The city says the existing limits allow sufficient acreage to meet demand. Tucson’s decision to limit the size of marijuana cultivation sites means growers are taking their farms — and jobs — to Phoenix. Dispensaries in Tucson city limits are allowed up to 3,000 square feet to grow marijuana off-site — provided they can find one that’s not too close to a school, church, park, child-care center or substance-abuse rehabilitation facility. 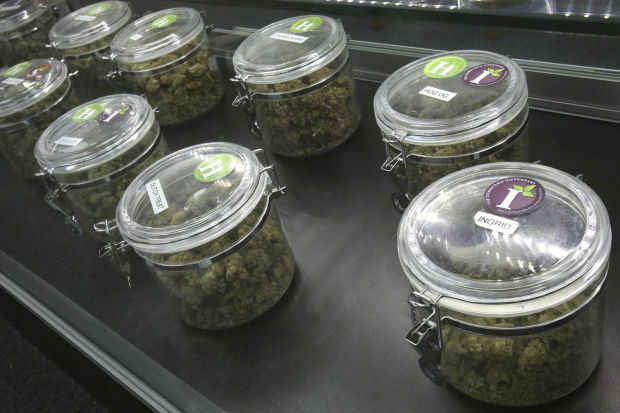 Sahuarita, Oro Valley and Pima County limit dispensaries to 2,000 square feet for cultivation. By contrast, Phoenix dispensaries can grow as much as they want off-site. That’s just fine with local officials. When jurisdictions set their zoning regulations, they anticipated how many people who would apply for and receive registration cards, said Tom Rankin, Pima County deputy attorney. “The notion that you were going to have these giant facilities growing marijuana just wasn’t necessary because that would produce enough marijuana for 10 times the number of patients that are authorized to have it,” Rankin said. Rankin said he believes the growing size provided is “absolutely sufficient” to meet the demand that exists right now “and for the foreseeable future.” Increasing the size of grow houses or setting up in remote areas to avoid zoning restrictions could also lead to greater risks, such as break-ins, he said. As it is, Rankin said, law enforcement often does not know the locations of cultivation sites because dispensaries are not required to disclose them. Bloom Dispensaries, which has two dispensary locations in Tucson, opened a 35,000-square-foot cultivation site in Phoenix last year. It employs more than 100 people, said Lezli Engelking, executive director of Bloom Phoenix and marketing director of Bloom Dispensaries. Bloom plans to open another grow facility, but it will not consider Tucson because of the limited growing allowed, Engelking said. Kris Krane, a managing partner with the Phoenix medical marijuana dispensary consulting firm 4Front, said that while his firm does not have Tucson clients, he has spoken with dispensary operators here who are interested in growing outside the city, specifically because of the square-foot limitation. He said that because Tucson is a dense urban area, the current limitation is not adequate to serve the population. “There’s economic benefits for cities to do this, and I think if they arbitrarily limit the square footage to something that is inadequate to meet patient demand, then the city is missing out on economic opportunities through jobs and revenue,” Krane said. Moe Asnani, a director of Downtown Dispensary in Tucson, 221 E. Sixth St., said he’s looking for a grow site larger than 15,000 square feet. The 3,000-square-foot limit doesn’t make sense for the dispensary, he said, because he believes marijuana sales in the state will only continue to grow. His dispensary has nearly 2,000 active patients. Vicky Puchi-Saavedra, who owns another of the eight dispensaries in Tucson, says business at Earth’s Healing, 2075 E. Benson Highway, has been brisk since it opened in June. Her patient count almost doubles each month, she said. But Puchi-Saavedra said her dispensary has already outgrown its cultivation site, and she is looking for a larger site to grow. Unless the city changes its rules, she said, she will choose a location outside of Tucson. Puchi-Saavedra said the size limits on grow sites, set after the Medical Marijuana Act passed in 2010, underestimated Tucson’s demand for medical marijuana. She said that even with her own off-site cultivation facility, she regularly has to buy more marijuana from other dispensaries in the area and in Phoenix to meet her customers’ demand. A 2013 report by the Arizona Department of Health Services shows there were 423,000 transactions during the year to nearly 41,000 medical marijuana cardholders, for a total of 2.7 tons of medical marijuana in Arizona. With an estimated store price of $350 per ounce, the sales resulted in $33 million in yearly revenue. Tucson’s idea in keeping cultivation sites small was that it could expand later if necessary, said Tucson Planning and Development Director Ernie Duarte. Public safety concerns also played a role. The City Council could change the square-footage limits through a public process to amend the Unified Development Code and Land Use Code, said Thomas McMahon, principal assistant city attorney. But there are no plans to do that, Duarte said. City may ask voters for a half-cent sales tax increase, but polling comes first.